Inspire Bingle: Do you keep an “ought to” list or a “want to” list? 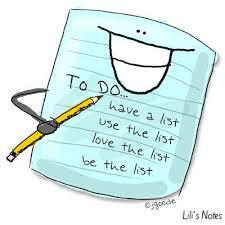 Do you keep an “ought to” list or a “want to” list? So what kind of lists do you keep? Not just the ones you write down, but the ones running around in your head—what do you call those lists? Do you keep an "ought to" list in mind? You know, I "ought to" do this. I "ought to" do that. I guess most of us do. I’m not exactly sure where we get these lists. What about a "want to" list? Do you keep one of those in mind? The kind where you list your heart’s desires, your soul’s longings, your spirit’s passion. Which list gets more of your daily attention? If you discovered today that you’ll die around 8PM, which list would you go to—the "ought to" or the "want to"? Yea, I thought so. Your "want to" list is a part of your spiritual DNA that God put in you. Your "ought to" list was installed by someone else. Today, remember that you’re free to choose which list to live from. Use your freedom wisely and choose God’s list, okay?